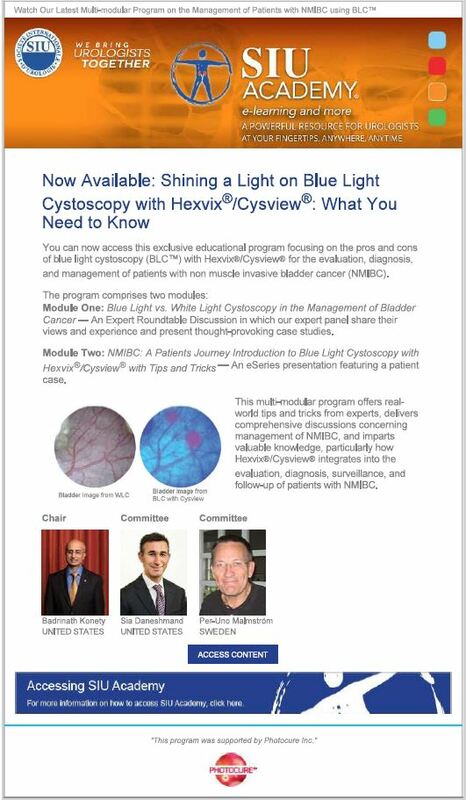 Access this exclusive educational program focusing on the pros and cons of blue light cystoscopy (BLC™) with Hexvix/Cysview for the evaluation, diagnosis, and management of patients with non-muscle invasive bladder cancer (NMIBC). Module One: Blue Light vs. White Light Cystoscopy in the Management of Bladder Cancer — An Expert Roundtable discussion in which our expert panel share their views and experience and present thought-provoking case studies. Module Two: NIMBC: A Patient’s Journey Introduction to Blue Light Cystoscopy with Hexvix/Cysview with Tips and Tricks — An eSeries presentation featuring a patient case. This multi-modular program offers real-world tips and tricks from experts, delivers comprehensive discussions concerning management of NMIBC, and imparts valuable knowledge, particularly how Hexvix/Cysview integrates into the evaluation, diagnosis, surveillance and follow-up of patients with NMIBC. For hot news and updates related to BLC with Cysview.